I wikipedia’d the ending of American Gods. Because I was 70% finished and still utterly uninvested in the characters and unrolling of plot. Here’s what I discovered on the wiki: almost all the excitement must take place in the final 30%! Half of the wikipedia summary is devoted to the final quarter of the novel! I’m a very forgiving person when it comes to litcrit, but one thing I can’t forgive in a book is boringness! And oh how I was bored! I read American Gods sporadically. The beginning caught my attention but as the book went on, nothing interesting happened. Worse, the protagonist’s personality has less flavor than the BRAT diet I’m currently consuming to recover from the stomach flu. Like this protagonist is DULL. Another thing I can’t forgive: when things are super enigmatic and it’s obvious that questions MUST BE ASKED, but for NO APPARENT REASON, a character REFUSES TO ASK THESE MUST BE ASKED QUESTIONS. I think most authors use this lack of curiosity on the part of the protag as a way to increase reader interest. Obviously a story isn’t much fun if there is no mystery. Harry: Yo Dumbledore, why did Voldemort try to kill me but fail and then give me this bizarro lightning scar and now we seem fated to like, kill each other or something? But I find it hard to enjoy a story when I can feel an author purposely withholding information from me to serve his own storytelling purposes. Gaiman had some super ideas here. It’s an amazing metaphor for American belief and its paradoxical modernity/antiquity and its oft-discussed role as a ‘melting pot.’ I also have mad love for the Midwesterness at the core of this novel (Wisconsin!). 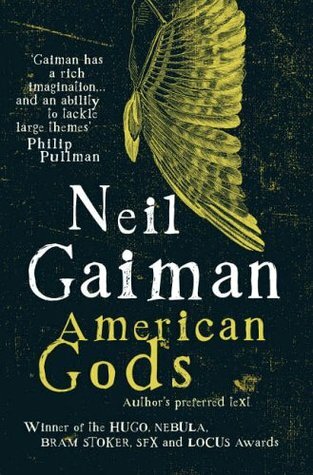 Yet for me a story must excite, thrill, titillate…and as a story, American Gods fails.